We need to eat to stay alive but food can be so much more than simply a means to a full stomach. Certain foods and ingredients have particular benefits to our health and can help to stave off illness and even lessen the risk of developing certain diseases. There are obvious things we can do to improve our diet and well being such as lowering our intake of saturated fats, eating plenty of fresh fruit and vegetables and taking regular exercise. However, there are a number of foods that you should definitely include in your diet if you want to stay healthy and try and avoid those winter bugs. It's easy to introduce all of the following foods into your daily eating regime; snack on fresh fruit, serve vegetables with your main meal and swap some of your usual ingredients to include other, more beneficial ones. As a student, you are particularly vulnerable to winter bugs and infections, as your diet might not be as well-balanced as it should be and you'll be living and mixing closely with a lot of other people, so germs tend to spread more quickly. Here are a few foods that are easy to find, easy to eat and full to the brim of nutritional goodies. 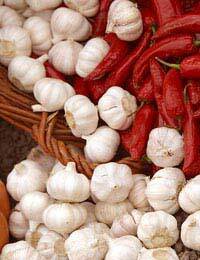 Apart from adding tonnes of flavour to all sorts of dishes, garlic is amazingly good for you. It can help circulation, lower blood pressure and has antibiotic properties. Don't make dinner without it! You must have heard all the hype about omega-3 oils. It's justified, as this is real brain food - perfect for hardworking students. Some of the most beneficial fish to eat is salmon, mackerel and sardines. If you're not a fish fan, you can buy supplements so you don't miss out on the benefits. Leafy green vegetables will add a healthy boost to your diet and you should try to include them as often as possible. Broccoli, spinach and kale are easy to incorporate into meals and they are full of minerals such as zinc and magnesium. Fresh fruit is packed full of vitamins and mineral that will help you fight bugs. Vitamin C is especially important for boosting your immune system. Some top choices for this vital vitamin are kiwi fruit, oranges, apples, grapefruit and berries such as blackberries, cranberries and blueberries. Alternate your regular tea with green tea or, better still, make a complete switch. It has been drunk in China and Japan for hundreds of years, as it is believed to help the immune system and to guard against certain illnesses. We are just beginning to really appreciate the health-giving benefits of this drink in the west. Here's the perfect excuse to cook up a nice hot curry or chilli con carne for your housemates. Chillies contain antioxidants that might help to prevent certain diseases. They can also help to boost your immune system. There are many everyday foods that can add a real boost to your health and hopefully stop you catching every cough and cold that's floating around the student union. By including a few of these ingredients in your meals, you will be giving your body a stronger defence against illness.